Nolan Rucker, B.S., D.V.M., M.S. Dean of Education, Program Director, and Professor. Anatomy & Physiology I Lecture. Anatomy & Physiology II Lecture. Curriculum review; ensuring the excellence of the academic content of Bel-Rea’s Veterinary Technician Training Program. Dr. Rucker graduated from the University of Missouri in 1970. He has worked as a Small Animal Surgery Instructor at Auburn University, was the Director of Research for the Comparative Neuroscience Center in Denver, has been active in research projects in the field of spinal trauma, and is a past president of the Denver Area Veterinary Society. 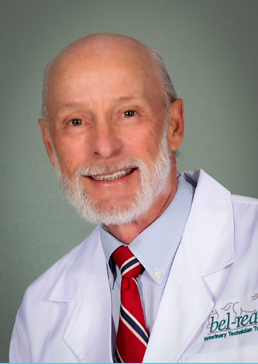 Dr. Rucker practiced for 24 years at Alameda East Veterinary Hospital and taught classes at Bel-Rea prior to becoming the Dean of Education in 1996. He is a past Adjunct Associate Professor at the University of Denver, a past Clinical Associate at Colorado State University’s Veterinary Teaching Hospital, and one of the founders of Bel-Rea. Professor since 1971. Trekking, mountain biking, cross country skiing, and ranching.